This film will make you want to travel, eat, learn, read and watch classic cinema… and enjoy it all with a good friend. 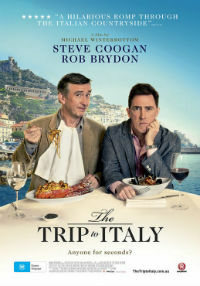 Like the many colourful dishes in this film, there’s something very appetising about the friendship between Steve Coogan and Rob Brydon. The first film, which had the pair touring northern England, was an unexpected hit of 2010. Made of footage from the television series of the same name, it was the kind of film you only watched based on recommendations and ratings. Even while watching it was difficult to explain exactly why it was so enjoyable. After all, it’s just two old men eating food, impressing themselves and one another with impersonations and talking about the kind of things you would discuss with your own friends if you were all a bit more intellectual. But simplicity was part of the charm. Apart from the location, The Trip to Italy is absolutely no different. This is a good thing. From the opening restaurant scene it comes across as a forced imitation of the first – even their imitations are exactly the same. Al Pacino, Michael Caine, Hugh Grant, Woody Allen, Sean Connery, they’re all there. But because of Brydon and Coogan’s fascinating chemistry (and the fact you can never quite tell if they love to hate each other or vice-versa) it doesn’t take long for their company to feel very familiar. Just sit back and enjoy the ride. The character tables have turned this time around, with Coogan playing the straight man to Brydon’s almost fame-indulged persona. This not only highlights the fact it’s completely fictitious, but also makes you wonder which of these experiences and/or people are based on elements closer to home. In the end it is the picturesque Italian landscape stealing every scene. The hotel-room views are just as tempting as the food – tourism is bound to spike as a result. It’s not hard to understand why this film was made and why there’ll likely be more. Apart from being a competent sequel by director Michael Winterbottom, it’s also a great excuse for the two leads to travel, eat, drink wine and banter while getting paid for it. It’d be enough to make you jealous if it wasn’t so much fun to watch!